Saluting my Gold Star Mother Grandmother, Agnes Cervo Stevens, who were she still alive, would be 111 years old! Grandma was tall, with blue eyes and blonde hair and I am honored to be her namesake. Agnes was many things. She was a wife and mother of four children, including my Mom- Dorothy, Joseph, Carmen, and Marion. Back in the day, she served as midwife to the Italian relatives and friends. O and how she loved baseball! Specifically, Yankees baseball… but in a pinch, the Mets would do. At 40, Grams learned to drive a car, obtain a job outside of the home, play golf, and bowl in a league. However, her most honorable role was that of Gold Star Mother! 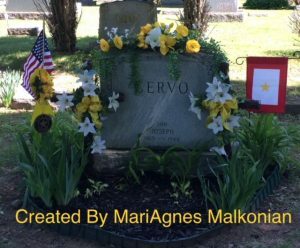 She memorialized her son, my uncle, Army Private Joseph Cervo of Rome New York, who was a paratrooper with the 101st Airborne in World War II during Operation Market Garden and at the age of 19, died in a prisoner of war camp. Grandma taught me the importance of remembering our Veterans’ sacrifices. Agnes accepted her role as a Gold Star Mother with dignity, serving at the local, state, and national levels for more than 40 years! She marched in all the parades well into her 80’s until health and infirmity prevented her from doing so. She planted red geraniums at the family grave-site where her beloved first born Joe is buried. agnavox HIFI, until her death in 1999. At the time of her death, on September 14, 1999 Grandma was the oldest living Gold Star Mother in New York State. Several times a year, I make the solemn journey to Rome New York, to the Rome Cemetery, where she and her loved ones are laid to rest. I tend to the new garden I planted, clean the family gravestone, and ensure that evidence of heroes and the woman who loved them, remains.